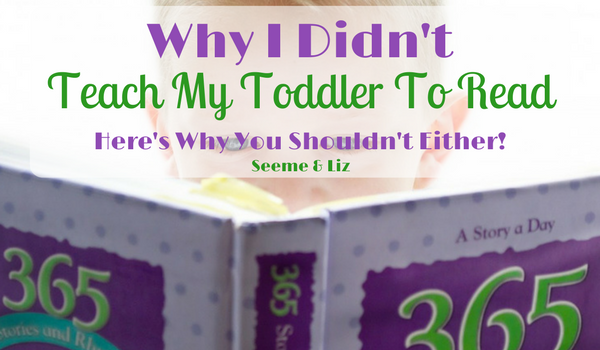 Seeme & Liz > Parenting Tips (0-2 year olds) > Why I Didn’t Teach My Toddler To Read – And Why You Shouldn’t Either! 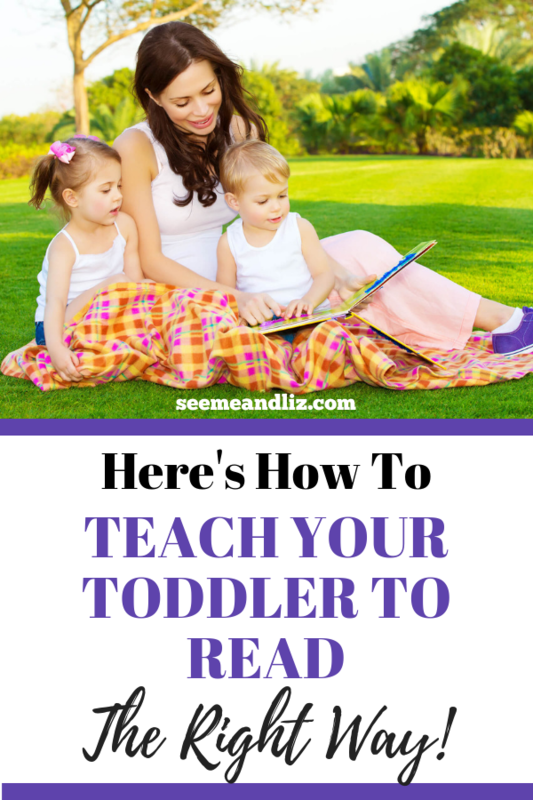 Were you searching for for “ways to teach my toddler to read?” when you stumbled on this article? Whatever brought you to Seeme & Liz, I am glad that you are here so I can share with you why it’s best to avoid programs that claim they will teach a baby or toddler to read. Toddlers (and even babies) can be taught to memorize, but they can’t really be taught to read. Not in the true sense of the word “read”. Reading is very complex and requires many foundation skills to be in place in order for a child to be a successful reader. 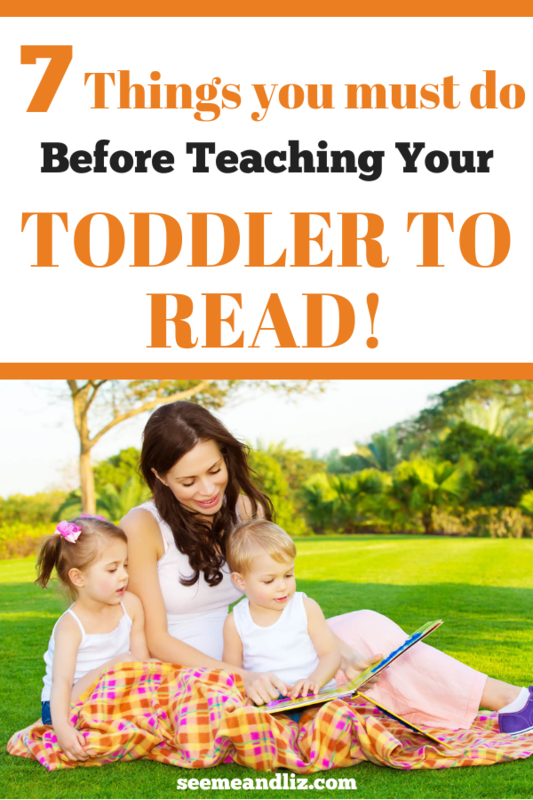 In this article I am going to share with you my reasons for not teaching my toddler to read. Teach Your Toddler To Read The Right Way! As a former Speech-Language Pathologist I can tell you that there are many skills a toddler can and should be learning, but reading is not one of them. There is no study that I could find that definitively correlates early reading ability with later academic success. In fact, in many Scandinavian countries where children excel academically, they do not receive formal reading instruction until the age of 7. However, there is plenty of information that supports the idea that toddlers with superior oral language skills (this is often seen in children who partake in lots of pretend play) do better with reading and writing once they are in the higher elementary grades. My children are 9 and 11 now and both of them are doing very well with reading (for their age) and neither of them could read a word prior to the age of 4. Developmentally, most children are ready to start reading and being taught to read closer to the age of 6 (this is an average, some aren’t ready until the age of 7). And, children who can read at the age of 4 aren’t any further along than those who started reading later by the time they reach grade 4. Prior to that age the majority of children’s brains are not able to decode a letter, combine letters and then form words. Children also need to have a large vocabulary base in order to understand the words that they are reading or to decode new words. And the best way to expand a toddler’s vocabulary is through play! Did you know that children who are taught to read before they are developmentally ready often struggle with reading comprehension in grades 3/4? This is because much of what they learned has been memorized and not truly understood. Other studies are finding that executive functioning skills, or lack thereof, play a role in students who struggle with reading. These types of skills need to be gained before reading will be successful. Skills such as these are learned through play and interacting with others. Did you know that sequencing skills are part of the larger group of executive skills? There are many activities that you can do with your toddler that will help him learn to read once he is ready. Yes, playing will prepare your child for academic skills including reading. Play is a building block for skills that a child will acquire later on. When a child is playing he is learning new vocabulary. A study conducted by Meredith Rowe in 2012 found that the size of a child’s vocabulary in kindergarten can predict his ability to learn to read (A Longitudinal Investigation of the Role of Quantity and Quality of Child-Directed Speech in Vocabulary Development. Child Development: 83(5), 1762-1774). Rowe also found that it isn’t simply the amount of words used that matter, but also the types of words. So go ahead and introduce your child to new words during play. But don’t go overboard. Make sure you keep the interactions natural. For example, when playing with a toy train, instead of always saying the “train driver” you could mix it up and say “engineer”. But make sure to let your child know that someone who drives a train is called an “engineer”. Be explicit when introducing new words. Tell your child exactly what the new word means. It is best to introduce new vocabulary words during a play activity your child has expressed interest in. He will be more likely to retain the new words than if it were in a not so exciting activity. This is why it is important to follow your child’s lead in play! Another great way to introduce new words is when you are reading to your child. Many words that you probably wouldn’t use with your child will often come up this way. When a child is playing, especially during more advanced pretend play that you will see 3+ year old children engaging in, he is making symbolic connections. For example, you may see a child pretending a block is a phone and “talking” into it. This symbolic representation is a precursor to the symbolism that happens during reading as each sound is symbolized by a letter. Each letter makes up a word which is another symbol. And then that word is given meaning. This may seem like an odd thing to suggest, but I will explain how this relates to reading. A logo or sign is a symbol for something (a store or restaurant are great examples). So the next time your child point’s out the McDonald’s Golden Arches, think of it as a good thing. This means your child has made the connection between the sign/logo and a place he likes to eat. Reading is very similar. You must understand that letters make up words and each word has a different meaning. Therefore, your toddler has learned a pre-requisite skill for reading by making the association between a logo and a place. This is a given. Your child needs to hear others read before she will be able to read by herself. Most children enjoy listening to their parents read to them starting at around 6 months of age. But it is totally fine to start reading to your baby right from birth. This introduces your child to books. Start with simple picture books and as your child gets older you can read books with rhyme and repetition. Before you know it she will be trying to “read” just like you do. During book reading, make sure you point to pictures. Wait and see if your child will point to a picture. Does he say a word or wait for a response from you? By labeling the pictures you are teaching that pictures are a symbol for something real. Just like the letters that make up a word are a symbol. You can also make up your own story. You do not need to follow each book word for word. The goal of reading to a toddler is to get them interested in books. Have books easily accessible for your toddler. Observe her with a book. How does she hold it? Does she turn one page at a time or multiple pages at once? Model the correct way to hold a book. If your child is looking at the book upside down, turn it around for him and comment “oops, the book is upside down, turn it around”. But don’t do this all the time. Give your child space to explore books freely as well. When you are reading with your child, occasionally use your finger to follow along with the words so that your child sees that you are looking at the text. Have some letter insert puzzles or magnetic letters (the kind that stick on the fridge) around for your toddler to play with. Point out the letters in his name. Most children start recognizing their name in print around the age of 3. Say the sound that each letter makes when you are talking about letters. This will help your child with reading later on. But be careful to not go overboard with this. Incorporate this activity with his other toys so that it is still seen as playing. The ability to rhyme is part of what speech pathologists refer to as phonological awareness. Phonological awareness is a whole other area I am not going to get into, but basically a child’s phonological awareness is an extremely accurate predictor of reading success later on. For now we will stick with rhyming because it is something toddlers and children love. Sing songs with rhymes (e.g. Down by the bay), so that your little one starts hearing the subtle differences that occur when you change one sound in a word. Make up your own rhyming game. There are also many books that contain rhymes. Below are great first books because they introduce rhyming in a fun way. Just like when a 2 year old “writes” a story (think of scribbles on a paper), a 3-4 year old may try to write “words”. But the word in question may be difficult to figure out as it might just be a single letter. But this is a good thing. As children get older they will include more letters to their word so the “b” that mean “baby” when your 3 year old wrote it might become “by” by the age of 4/5 and by the age of 6 you might see it spelled as “bby”. For many children, vowels seem to be the last letters to get included. What your child is doing is inventing his own spelling based on how a letter sounds phonetically. But what does this all have to do with reading? Instead of me going into it all in this article, here is a great piece written by a teacher that explains it very well! 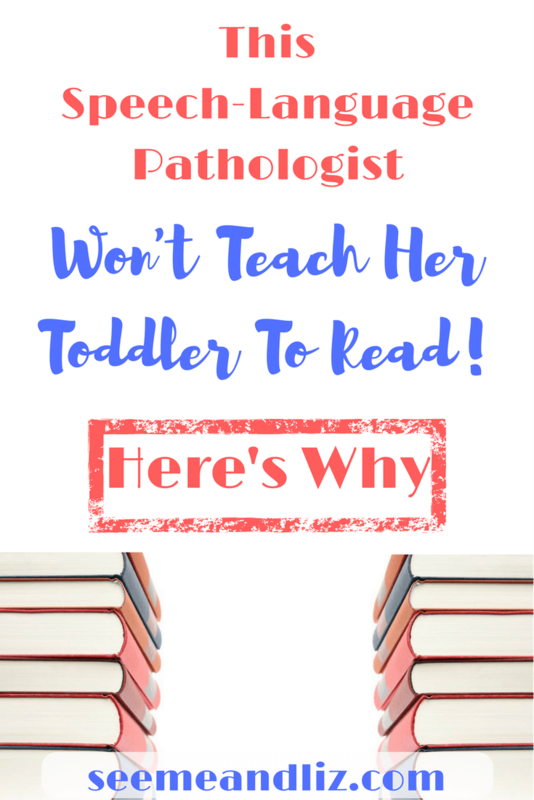 Will You Still “Teach” Your Toddler To Read? As you can see, there is a lot a toddler needs to know before he can learn to read. Do Not Skip These Important Steps! Yes, a toddler can learn to memorize words and even match them to the correct picture (e.g. C-A-T and then find the picture of a cat) which makes it seem like they are reading. And it’s an impressive looking skill seeing a 2 year old match a word to a picture! We all know how important literacy is so of course it’s natural to want children to learn this important skill as soon as possible. But our brains develop a certain way and we can’t force things prematurely as the end result could be quite different from what was intended. However, if your child does not have the necessary pre-reading building blocks blocks in place, she may not become a successful independent reader once she starts school. Reading is more than just recognizing and saying words. You must also understand what you have read for there to be any point to reading. 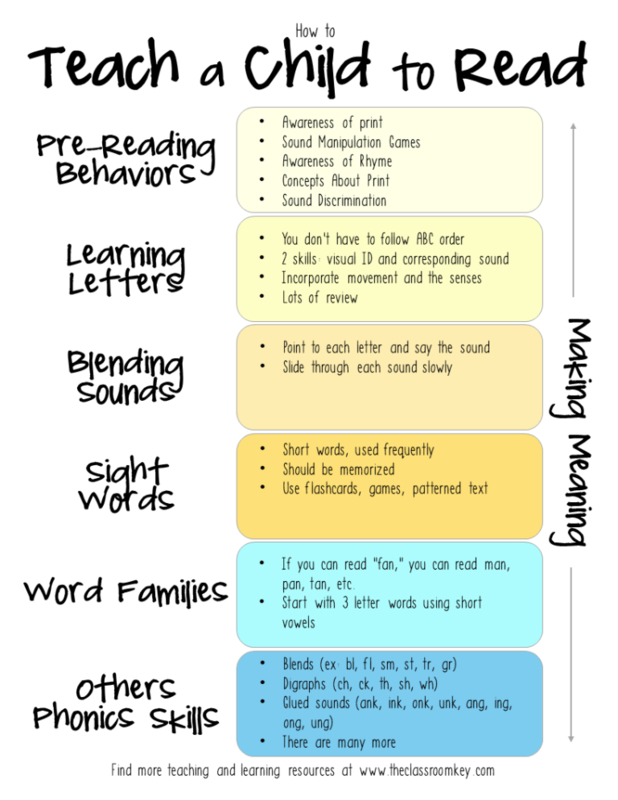 Here is a great infographic by The Classroom Key showing exactly what is involved in learning to read. 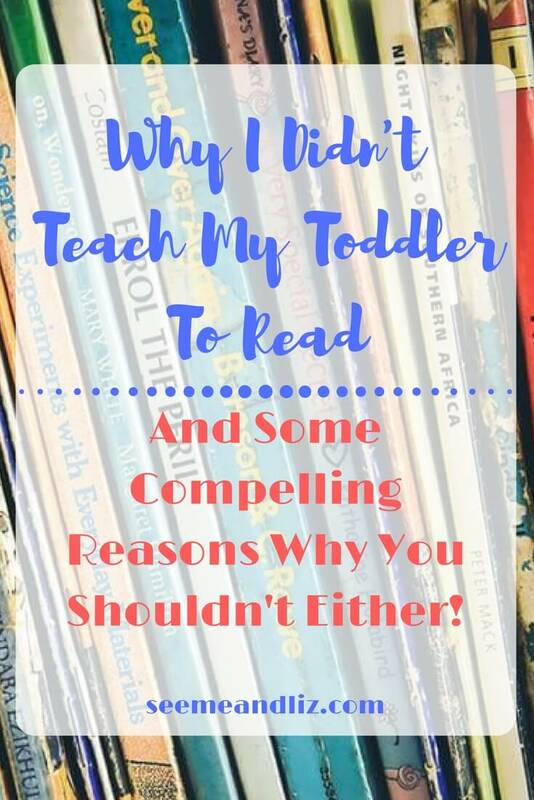 These are some of the many reasons why I did not teach my toddler to read! Have I convinced you not to try and teach yours either? Try not to rush your toddler into becoming a school aged child. There is plenty of time for that. Focus on giving your toddler what he needs now to become successful later on! And that is face to face interactions with important people in your child’s life. While a young child may love sitting in front of the TV watching “learn to read” videos, this is not the best way. Hi, you have a great assembly of great information and games for us to choose from. I’m too not trying to teach our little one to read yet but some of your suggested toys here I would love to let her have. I live in Thailand and I think the schools here are only teaching to remember things instead of understanding the reason why somethings are the way they are. I think doing some educational or motivational games at home can help out a lot in this matter. It’s unfortunate that some countries value rote memorization over giving children the skills they need to help them understand and become more independent learners. Play is the best way for a child to learn! If school is based on memorization and academics, make sure time spent at home isn’t “academic”. I completely agree with you, my youngest son, who’s four now, would never have been able to string letters together into a word situation when he was a toddler – counting up to five was a task for him (and is for most toddler aged children). I didn’t really realise that there were so many products out there trying to make money off the parents who want a nuclear physicist as a child – I suppose these types of parents are easy targets for letting go of their money! I read to my youngest son every night now, and tell him about Welsh legends I heard in my youth (dragons etc). Is there proof that this sort of interaction can help their development – being read to? Reading to your son is one of the best things you can do! You should continue to do this even once he starts school. Reading to a child helps in so many ways including literacy development! If he shows an interest in words and letters then by all means point them out and label them. Follow his lead! I totally agree that there is no need to teach kids to learn how to read before grade 1 or even pre-school. Putting pressure on them is not beneficial to their learning & might actually repel them from the idea of “formal learning” if they are pushed too hard to learn. Let learning comes naturally at a young age – through toys! Especially thru Science, Technology, Engineering, Math (STEM) toys! Simple toys are a great way for children to learn naturally. Toys that don’t require batteries are even better for toddlers! STEM toys such as blocks and puzzles are great for toddlers! I do agree parents shouldn’t formally try to teach their young child to read. But don’t forget some children learn to read simply by being read to etc. without any formal instruction. So… If a young child, such as a 3 year old is reading, we shouldn’t assume a parent has taught their child to read. For sure, if your child really shows an interest in reading then go with it. But the majority of 3 year old’s aren’t really interested in learning to read. If your 3 year old is showing a lot of interest in books, make sure to spend a lot of time looking at books, holding them properly, pointing to pictures, etc. The foundation skills need to be set in order for a child to be a successful reader later on. My little boy is almost 2 years old and I didn’t even realise there was a “thing” about teaching a toddler to read, it seems so advanced compared to where we are that I can’t even imagine trying! We do read books every day, but it’s more about getting him to point to pictures and some repetition of the words at the moment. Caroline, you really seem to have this parenting thing all figured out! Let your son be a kid, and it sounds like you are doing just that! There are many good toys out there but many are also over the top and unnecessary for a young child. Reading together is great and something I always encourage. It’s a great bonding experience and can help instill a love of books and reading later on. At 2 years old I wouldn’t expect anything other than pointing to and labeling pictures. Thank you for the article! I think some parents are probably a little over-zealous with getting their toddlers advanced in reading and math. My jaw fell open the other day because my not even 2 year old boy pointed to the letters of the book I was reading him and read out all the letters. I never taught him letters – he just watches a little sesame street every day and I’ve read to him since he was old enough to sit on a chair holding himself up enough. I think that was around 5-6 months – I certainly never expected him to really absorb all the letters but he had phases where he was more interested in the words in the book than the pictures. Now he tries to say what is in the pictures. I enjoy the process of just watching what he picks up but I don’t drill him or make him sit there and memorize things – I figure he’ll have plenty of that in school much later. But I do love that he has a love for books and that makes me very happy because I really loved books too as a child – I hope he keeps that going but thank you for pointing out the benefits of not forcing it. I notice you mention rhyming games – I don’t do this yet but I should look into that more. Thanks for your comment Maria! Your son really has a natural love of reading. There is nothing wrong with doing what you are doing. If he is initiating pointing out and naming letters, then go with it. Some children pick up these skills easily and often before an age where it is expected. There is nothing wrong with this. I don’t want parents to feel like they have to suppress their child’s learning. That is not the case. I simply want to point out that reading and other academic skills are not the be all and end all and that there are many other skills that need to be developed first. Keep doing what you are doing! For sure sing some rhyming songs or make up your own rhymes with your son. I am sure he will love it! Hi Tanja, I have 2 tots 2.5 years old and 1.5 years old. My in laws are insisting that I enroll them into nursery to start learning so that they won’t fall behind their peers in elementary school. But I have been told by most that the purpose of the nursery is for social development and whilst socializing with other kids learn the basics like ABC and numbers or improving their communication skills. For now we are just playing at home with what the kids like colouring, making a mess, dancing to youtube songs and peppa pig of course. Your children are still very young. No need to rush them. This is the time for them to play and explore. Children under the age of 5 learn best through play. This play should be a mix of unstructured child led play and some adult guided play. There is nothing wrong with sending a child to nursery school, but try and choose one that uses a play based approach as opposed to an academic approach. You and your in-laws may find these articles interesting. Wow, this is really useful! I definitely agree with playing. My toddler is 2 and we will be doing what you suggested. I am a bit worried though because my mother in law did unschooling with her kids and my husband and his sister can’t read. Maybe she didn’t do enough to help them like what you suggested. Could you maybe give me some insight? Would love to hear from you. Thanks! I have heard of unschooling, but I don’t really know much about it. The impression that I get is that there is absolutely no curriculum that is followed and that all learning is completely child led. Obviously I am a fan of child led learning, however at some point I do believe that an adult must step in and guide a child so that crucial elements such as reading, writing and basic math skills are taught. I am sorry to hear that your husband and his sister cannot read. Please be assured that this is not due to following a child’s lead. This article on not teaching a toddler to read was meant to show parents that there are so many other skills a child must have prior to learning to read. Without these skills it will be difficult for a child to become a truly independent leader. The focus in the early years of a child’s life should be learning through play (both unstructured free play and play with a bit of structure). The skills learned through play will help a child with future academic success. I agree Tanya that play is far more important than learning to read as a toddler. Interactive learning is so rewarding for both a parent and a child. I thoroughly enjoyed reading to my children when they were younger. Although they are older now I still think their early days of play made all the difference to their successful schooling. I really enjoyed your article it bought back wonderful memories. Sounds like you were on the right track with your children when they were younger! My goal with this site is to encourage parents to give their children the gift of play! Children grow up quickly and most of their years will be filled with academics. I feel the same way about “studying” for tests… Memorizing the answers isn’t actually teaching you anything. Learning how to read versus memorizing words is kind of the same concept. I also agree that by trying to speed up the process of your toddler learning how to read; you’re actually doing more harm than good. Let kids be kids. There’s a reason we follow a certain outline. Thanks for your comment Diana! You are right on with the studying for tests analogy! I remember using memorization as a study technique. I did well on the test, but then all of the information I had worked so hard to memorize was forgotten. Wow, this is certainly an eye-opening article. I have a toddler who is always playing and using his imagination. He loves seeing how things work and doesn’t even want the TV on most of the time. It’s good to know that I’m doing the right thing with my kids developmentally and that they are where they need to be. Thanks for your comment Ian. I find so many parents really focus on their child’s academic development. They have good intentions, thinking that if they teach their child skills like reading, writing, counting, etc from a very young age their child will do better in school. However, this is not true. It sounds like you are on the right track with your toddler! If he isn’t interested in the TV then keep it off. Don’t even have it on in the background as it can be distracting to what he is doing.